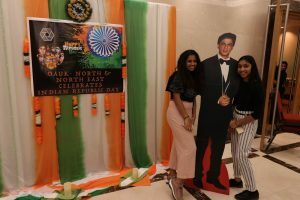 Botown 2019 | Oshwal Association of the U.K.
On Saturday 26th January – India’s Republic Day – over 400 people attended a ground-breaking night at Oshwal Centre. In a twist to the wonderful traditional music nights hosted over the years, this special night hosted not one, but TWO modern music shows. 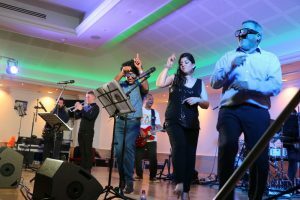 The first act was the legendary Botown, a British Asian band who play a musical re-imagining of the Bollywood genre, tinged with funk and soul of the Motown era, with a bold brass section. Botown treated the crowd to numerous classics, including golden oldies such as Dum Maro Dum from the 1971 film Hare Krishna Hare Rama, Roop Tera Mastana from 1972’s Aradhana, to the (slightly!) more recent Kajara Re from the film Bunty Aur Babli (2005), and 2003’s tear-jerker Kal Ho Na Ho from the film of the same name. After Botown completed their set, the audience descended to the lower hall for dessert and were treated with a delicious vegan carrot cake, whilst the second act – a live DJ Set from DJ Nills kicked off. The Indian National Anthem Jana Gana Mana, composed by Bengali poet Rabindranath Tagore, was played as the audience stood in respect. 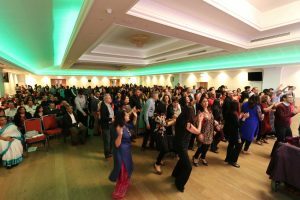 Straight after this, DJ Nills had the entire dance floor packed, and again the crowd of all ages were dancing away to Bhangra, Bollywood and RnB hits. Unfortunately, the evening had to finish at 11pm, but the crowds lingered and the atmosphere was still buzzing as everyone slowly left.